New Delhi: The public accounts committee (PAC) that’s probing Air India Ltd’s massive debt build-up has sought replies from the aviation ministry on possible irregularities in a $11 billion (Rs 54,340 crore today) deal to buy aircraft. 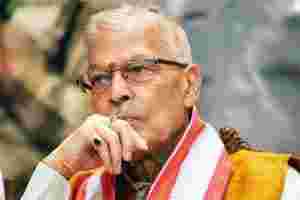 The panel led by Murli Manohar Joshi, a leader of the main opposition Bharatiya Janata Party, has sought answers to 33 questions, including the reason for a long delay in procuring the aircraft in the 1990s and then significantly increasing the order. The panel has also sought an explanation on the generous flying rights awarded to foreign carriers, especially in West Asia, which hurt Air India’s position, said two aviation ministry officials, declining to be identified. “They couldn’t have been more innovative," one of them said, referring to the similarity with the queries sent by the national auditor. “A 65-page reply is being prepared to be sent to them." Two months ago, the Comptroller and Auditor General of India (CAG) criticized the aviation ministry in a 121-page report for decisions related to the aircraft purchase. Many of the decisions in the audited period were taken during the tenure of former civil aviation minister Praful Patel, a leader of the Nationalist Congress Party, an ally of the ruling Congress party in the United Progressive Alliance government. Joshi could not be reached for comment as he was travelling. PAC may ask former Air India chairmen V. Thulasidas, Raghu Menon and Arvind Jadhav, besides Patel, to appear before it, the same official said. The PAC’s first meeting scheduled for 1 November, however, was postponed. Air India has gone from being a self-sustaining public sector entity to near-bankruptcy in the past seven years. It has defaulted on several payments, including salaries to its 30,000 employees. In 2002-03, Air India (the combined entity of Indian Airlines and Air India) lost ₹ 63 crore. The loss ballooned to nearly ₹ 7,000 crore in 2010-11 after a much-publicized merger in 2007 that was aimed at making the airline profitable by the third year. The airline is now seeking a bailout package of about ₹ 25,000 crore from the government, which, if cleared, will be paid for by taxpayers’ money. A group of ministers last month sent the proposal to the Reserve Bank of India for consideration. The aviation ministry fears Air India could become the focus of Parliament’s winter session, said the second official mentioned earlier. Besides, at least two public interest litigation (PILs) have been filed in courts seeking a wider probe into the deterioration of the state-owned carrier. One of the PILs was quashed by the courts earlier this week, asking the petitioner to wait for the outcome of the PAC’s proceedings before the courts can intervene. The second PIL, filed by Anna Hazare’s India Against Corruption group and led by lawyer-activist Prashant Bhushan, will come up for hearing in the second half of this month. The PIL, reviewed by Mint, points out that Air India had withdrawn from several international routes including Kolkata-Bangkok, Kolkata-Dhaka, Doha-Cochin and Cochin-Kuwait, opening it up for private operators. The PIL says it wants the “Central Vigilance Commission to conduct a thorough inquiry into the aircraft acquisition deals of Air India and its loss of marketshare by giving up profitable routes and timings and the role played by civil aviation ministry". Air India initially planned to acquire 28 small- and medium-capacity aircraft, but in 2004 decided to buy 68 planes. An analyst said the PAC should take the investigation forward from the CAG. “The report will be worthwhile if they really go deep into the aircraft orders as well as the leasing agreements," said Mohan Ranganathan, an aviation safety expert and a member of the government-appointed Civil Aviation Safety Advisory Council. “If they go by coalition dharma, they can throw it into the dustbin."